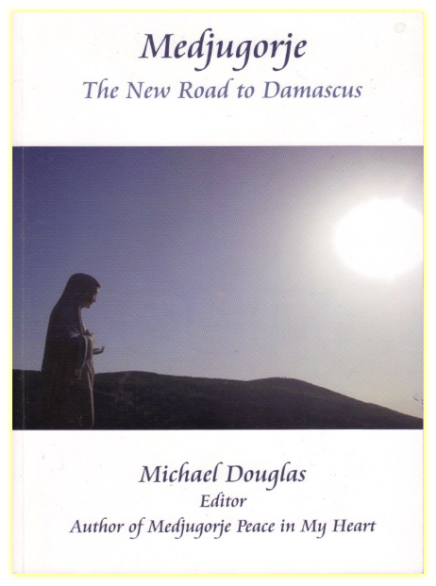 Michael Douglas (author of Medjugorje - Peace in my heart) has launched a new book called Medjugorje - The new road to Damascus. It features 20 stories with one common thread, Medjugorje. 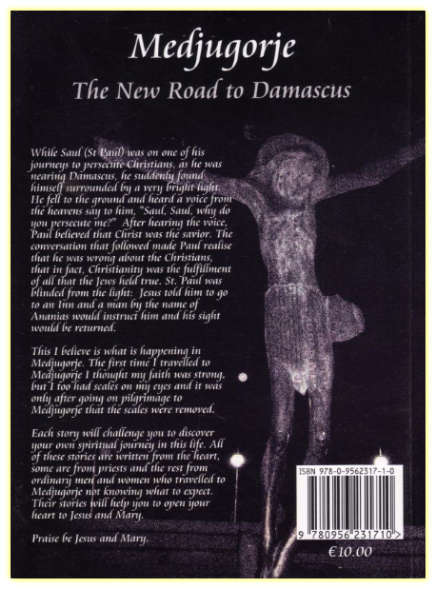 All of these stories are written from the heart, some are from priests and the rest from ordinary men and women who travelled to Medjugorje not knowing what to expect. Their stories will help you to open your heart to Jesus and Mary. All profits from this book go to Fr Svetozar's "Mothers Village". Copies of the book are available from the following outlets VERITAS bookshop Abbey street Dublin 1, Clonfert (Eddie Stone), Cathedral bookshop Galway and Mothers Village Medjugorje. I first heard of Medjugorje in 1986, I was 15yrs old and the apparitions of Our Lady were already occuring daily since 1981. My neighbour had a rather large garage and they invited us neighbours to come and see a video of Medjugorje. I was very moved by it and remember thinking that I was the same age as the youngest visionary Jacov. It wasn't until 14 years later that I landed on Medjugorje soil. I had been deeply touched by Our Blessed Mother on Tues 31st August 1999. Touched to such a degree that it totally changed my life. God had poured out His grace upon me during this my first ever trip to Medjugorje. He gave me the grace to see Our Lady. What a profound experience that will live with me until I die. The church was full, so we sat outside on a bench to pray the rosary - my Mum, my Aunt and I. My head was bent downwards looking at my beads when it was caused to look up. 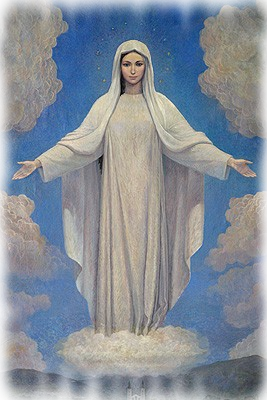 There in front of me was our dear Blessed Mother as radiant as could be, standing on a cloud, arms outstretched towards me and She was smiling at me. A smile that was so filled with love, a smile that was beyond human comprehension, a smile that was so fulfilling that words were not necessary. Clad in a greyish-white dress that draped to her feet, a white veil and a crown of stars around her head. A powerful heat enveloped my body begining at my head and going down to my feet. My heart was burning. I was speechless, I couldnt even say I love you dear Blessed Mother, all I could do was fix my eyes on her beauty. I dont know how long it lasted it was just that I could no longer see Her. I was perplexed, why was I allowed to see Our Lady? What had I done to see such a Heavenly vision?- nothing, but it was obviously God's plan 1. During that trip at Holy Mass one morning, the priest spoke about fortune telling, horescopes and new age practices in his homily. It hit me straight in the heart, it was if I was the only one in the church and that homily was directed at me. I had been to many fortune tellers over the years and had encouraged my friends to go also. I thought it was fun, I didnt think it as a sin. That evening I decided to go and confess it in confession and when I opened the door of the confession box there in front of me was the priest who had given the homily that morning! I told him about going to fortune tellers and all my other sins. He prayed a deliverence prayer over me and gave me absolution. From that day to this I haven't been to a fortune teller or read my horescope. I came out of that confession as free as a bird. I went home a changed person. All I knew was that I had an over whelming desire in my heart to return to that place, where Heaven and earth meet. That place, a small valley surrounded by holy mountains. That place where the void in my heart was filled and filled to over-flowing with peace, joy and love. The three little words that are Jesus. I arrived back in Medjugorje in June 2001, confident that the Holy Spirit had put it on my heart to give up my montessori teaching job and spend some time there. The week I arrived was the week of the 20th anniversary of the first apparition. The village was thronged with people of all nationalities, all there because they had responded to Our Lady's call. I was comfortable with my surroundings, I felt I was at home. The dawning of each new day led me to Podbrdo, the hill where Our Lady appeared for the first time to the visionaries and indeed many subsequent times. I would take my time climbing, stopping at each plaque depicting the Joyful mysteries and pray the rosary. Arriving at the summit I would find a smooth rock to sit on and pray to Our Lady or just sit in silence and observe the beauty of the ruggedness- Our Heavenly Father's creation and breathe in the odour of holiness that effusses the entire hill. Podbrdo Hill reminds me of life's journey. Its uphill and rough (our lives are more often than not a struggle) and every so often there is a lovely smooth stone ( like when times are easy and good in our lives) and we strive to reach the summit ( we are all striving to get to Heaven) but can fall on the journey (like the times we fall into sin in our lives and someone comes to help us up to begin our journey again ( this is like the sacrament of confession where we get the chance to wipe ourselves clean and begin again). Living in Medjugorje was like looking in a magnifying mirror. It seemed as if all my faults and failings were staring me in the face. You are made aware of your sins. Before this I would just have confessed the same childhood sins in confession time and time again, but here you get a deeper awarness of your faults. The sacrament of Confession is under-estimated but it is such a powerful gift to us all and Our Lady in Medjugorje encourages us to go to confession at least once a month. I had the opportunity to help a nun called Sr Muriel, who brings food parcels to the poor and elderly of the neighbouring villages. It was such a humbling experience to serve these beautiful peeople. Sr. Muriel is an American nun living in Medjugorje for many years who daily visits the elderly. I recall one day loading up the van with food parcels and going out with Sr. Muriel to visit some people. As Sister drove along a windy road I asked who were we going to visit and Sister's reply was a very elderly man in his 70's, I laughed because Sister was in her mid seventies at that time, but didn't look a day over 50! On reaching our destinations we would bring the food packages into the houses or shacks. Sometimes there was no electricity or running water in the houses or one roomed homes. If the homes were simple the occupants were twice as humble. We were always greeted by a smiling face despite the pain and suffering they endured. We would pray 1 Our Father, 1 Hail Mary and 1 Glory be in Croaian. I would hold their hands as we prayed. I only had a few words of the native language, so the personal contact had to suffice. One lady showed me her wedding photo, her husband had been killed in the war in 1992. The years of hardship had taken their toll on the face of this woman, but her eyes were sparkling and they were filled with sadness as she spoke of the death of her husband and filled with deep gratitude for the food and for spending a brief moment with her. I didnt understand most of what she said but her eyes told her story. They say the eyes are the window of the soul. As I reflect on these times as I write, I come to the realisation that those people gave more to me than I ever gave to them. One grace Our Lord gave me while I lived in Medjugorje was the gift of spending time adoring Him in adoration of the Blessed Sacrament. Almost every afternoon I would go to the adoration chapel. It may sound strange, but Our Lady guided me in my prayer life while I was there. It was gentle as only Our Lady can be, Our Lady prepared me for what was to come. Adoration of Jesus in the Blessed sacrament is a poignant time where Jesus pours an abundant of graces and blessings into our hearts. Each moment we spend adoring Him, deepens our union with Him and makes our soul everlastingly more beautiful and glorious in Heaven. The days living in Medjugorje turned into months and at the end of the 5th month, I began to get sick. I lost alot of weight and was vomiting constantly. The Croatian family I was living with brought me to a clinic and the doctor gave me an injection to stop the vomiting but it didnt work. I had to be hospitalised in Mostar (my first time ever to be in hospital). This hospital was very basic and had no heating, we were in the throws of winter and I was getting weaker. Fortunately for me, one senior doctor spoke English and he organised a heater for me and extra blankets for my bed. Fr Ciaran Mc Donnell, an Irish priest living in Medjugorje at that time brought me Holy Communion every day. Chris form Colombos resturaunt in Medjugorje brought me food and two friends Suzi and Martin visited me everyday, I am forever grateful for their kindness. After a week I came out of hospital, feeling well again but this didnt last long as mid-December aproached I began to get weaker. Suzi and I booked our flights home for 19th December. At that time of year there was no direct flight back to Ireland and it seemed we had to go half way around the world to get home. We had to get a bus from Medjugorje to Zagreb an 8 hour journey then wait 3 hours in Zagreb before catching a flight to Hungary for another 6 hours wait for our flight back to Dublin. I know it was Our Lady that carried me on the journey home because I was so weak. With my Mums tender loving care and good cooking I felt well again but by January the weakness and vomiting returned. I was driven to hospital by a dear friend Michael and remained there for over 3 weeks and was diagnosed with a rare auto-immune disease called Addisons Disease 2 and I had gone into what is termed an addisonian crisis. This disease affects the adrenal glands and they cease working. In order to stay alive I have to take steroids twice a day, everyday. I have had 3 addisonian crisis' since and they are critical times, where I have to be rushed to hospital to get huge doses intravenous hydro-cortisone to prevent me from dying. After being diagnosed, thank God I was able to lead a pretty normal life. I began to bring small groups out to Medjugorje and to bring young people out to the youth festival. I had 4 weeks holidays a year from work and I used them all up to go to Medjugorje. I began to grow deeper in my faith and I joined a youth group called Youth 2000 which held weekly prayer meetings and retreats a few times a year and I also joined a group called Pure In Heart who promote chasity before marriage. Through these meetings I made many friends, true friends that have walked with me on my road of suffering even to this day. In June of 2006, I was diagnosed with another very rare auto-immune disease called "Dermatomyositis". A disease that attacks the muscles and the skin. I spent 15 weeks in hospital that year and under went many test. It was an extreemly difficult time as I began to loose power in every muscle of my body. My voice got really soft, my swollow deteriorated to the point that I could only eat pureed food. Getting out of a chair and walking was proving very difficult. My Mum was my tower of strength, she would come into the hospital each day around mid-day and stay until about 10 at night. She would cook all my food and bring it in to me. She would shower me and do my hair. She would wheel me down to the oratory in the hospital to pray. She gave totally of herself out of love for me and I thought to myself, would I do that if the tables were turned? I have been striped of all my masks, my attachments! I loved my fashion, make-up, jewellery and fake-tan. I can't wear any of these now. I was a vain person and I realise now the Lord is purifying my soul to make it beautiful. Its 2010 as I write and my condition has progressively worsened since then. I am now permenantly confined to a special chair that was made for me, or to my wheel-chair if I am going to hospital apointments. I am on alot of medication. I weight 6st 12 and for someone who is 5ft 10 this is severly underweight, but its all muscle mass loss, my muscles have wasted away I haven't much power in them but Thank God I can feed myself and do my calligraphy which God gave me the talent to do. I am dependant on my Mum to do almost everything else for me. Dad helps too, but my Mum was a nurse before my illness so she is my main carer and she's on call 24/7. My Mum is a saint for putting up with me through this and for putting her life on hold to care for me even though she has her own cross of constant back pain. I can never repay her kindness but the Lord will in Heaven. I've learned to accept this cross and not to fight it. There were time when I did try to fight it and I fell into a deep depression. I was prescribed anti-depressants but I didnt want to go on them, I felt I was on enough medication that I just couldn't take any more. Out of the blue a priest friend of mine Fr. Adrian came to my house and wanted to talk to me. I told him how I was feeling. He prayed over me and said "Ann-Marie, no matter how bad or how low you feel you can never go lower than the palm of God's hand". Thank God since that night the depression lifted and I have embraced my cross. I won't pretend its easy but I just take one day at a time and I'm learning to trust in Our Lord's mercy and goodness. I offer up this cross to Our Blessed Mother and Jesus everyday for their intentions and for the conversion of souls. I have a few close friends who visit me all the time. There are many many people spread across the world praying for me and having Holy masses offered for me and I ask the Lord to bless them all abundantly. I can no longer travel to Medjugorje, but I have it in my heart and it comes to me every evening via the internet. I thank God everyday for my faith because without it I don't know where I would be. I've had miracles in my life and I know I will have a huge one when I'm healed and the Lord will be Glorified and the doctors baffled!!!. Our Lady - Hail full of grace. Our Lady, spotless, without sin. I wanted to make a fresh start. To Her Son Jesus - Our Brother. My Mother - Hail full of grace. In thanks- giving for all that you do. 1. Editor’s Comment: The writer is not claiming to be a visionary but is sharing with the reader, a personal and private experience which can be accepted or rejected. 2. Addison's Disease: "A life-threatening condition caused by partial or complete failure of adrenocortical function, often resulting from autoimmune processes, infection (especially tubercular or fungal), neoplasm or haemorrhage in the gland. All three general functions of the adrenal cortex (glucocorticoid, mineralocoricoid, and androgenic) are lost." Mosby's Medical, Nursing, & Allied Health Dictionary, 6th ed., [Mosby, Missouri, USA, 2002] 37.